Pneunocystis jirovecii causes a severe interstitial pneumonia in immunocompromised patients, particularly those with AIDS. The taxonomy of this organism has been unclear; recently, nucleic acid studies demonstrate that this organism most closely resembles fungi. The trophozoites measure 1-5 µm (arrow in image on the right). The life cycle of this organism is not definately known. The trophozoites seem to replicate by binary fission and give rise to a cyst stage (at left). The cyst is round to oval and measures 5-8 µm. The cyst can also form cup or parentheses forms. 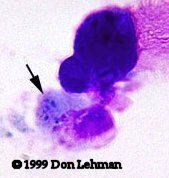 In some stains, a capsular dot can be seen. Cysts can contain up to 8 intracystic bodies (sporozoites).